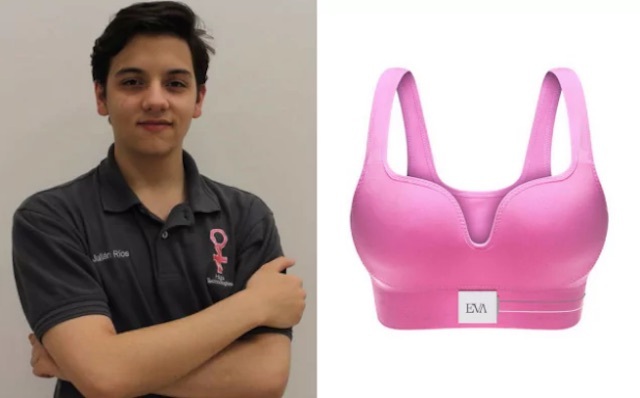 After almost losing his own mother to the disease, this Mexican teen has patented a bra that can detect early signs of breast cancer. 18-year-old Julian Rios Cantu is the designer of the Eva bra: a brazier with biosensors inside the lining that can moderate the temperature, texture, blood flow, and coloring of a woman’s breasts. The user only needs to wear the Eva bra for one to two hours per week in order for the apparel to properly monitor the body’s patterns and conditions. All the data is then downloaded by Bluetooth to an app that will alert the user if there is any alarming changes. Julian first got the idea when – years earlier – a mammogram detected two tumors in his mother’s breasts. Though the doctor originally identified them as benign, he was wrong – the lumps were malignant. Two years later, Julian’s mother had to undergo a double mastectomy. Julian then filed a patent for the bra and started a company to develop the bra with his friends. Though the prototype is still in the early stages of testing, Julian plans for his company Higia Technologies to start selling the undergarment as soon as December 2018. Higia Technologies was awarded the top prize of $20,000 at the Global Student Entrepreneur Awards last June.